Wireless notice board is very selective term for this project, as it has a very wide scope rather than just being a simple notice board. First we should understand the purpose of this project, in this system we can display a message or notice to some display device like LCD, and this message can be easily set or changed from anywhere in the world, just by using the SMS facility of your mobile handset. Whatever notice we want to display, just send the SMS of that text, with some prefix and suffix. This is very useful in Hotels, Malls, college, offices and can be used anywhere, even at home. Like you can set the message like “Do not disturb” at your hotel’s room gate, can set message at your home’s door step when you are away, and of course it is used as notice board in schools, colleges, cinema halls etc. And yes, it’s just not a simple Message board, the usefulness of this project is that you can set or change the message or notice from anywhere, just sending SMS from your phone. 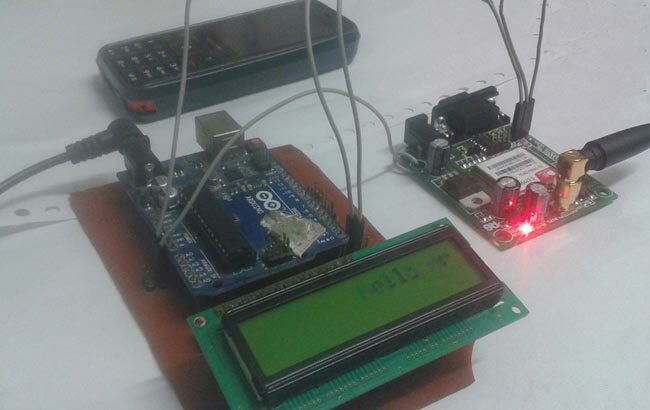 In this project, Arduino UNO is used for controlling the whole process, GSM module (SIM900A) to receive the SMS/message sent from mobile phone and LCD to display the message. We can send some message or notice like “#Circuit Digest*”, “#We Welcomes You*” through the SMS. Here we have used a prefix in the message string that is ‘#’. This prefix is used to identify the starting of the message or notice. And ‘*’ is used as suffix to indicate the end of the message or notice. When we send SMS from mobile phone to GSM module then GSM receives that SMS and sends it to Arduino. Now Arduino read this SMS and extract main notice message from the received string and stores in another string. And then sends the extracted message to 16x2 LCD by using appropriate commands. Further working of this system is explained in the ‘Code Description’ section below. Before we get into programming details we should know about GSM module. Ctrl+Z send message command (26 in decimal). Connections of Wireless Notice Board using GSM and Arduino are simple and shown in the figure below. Here a liquid crystal display (LCD) is used for display the “Notice” or message, which is sent though the mobile phone as SMS. Data pins of LCD namely RS, EN, D4, D5, D6, D7 are connected to arduino digital pin number 7, 6, 5, 4, 3, 2. And Rx and Tx pin of GSM module is directly connected at Tx and Rx pin of Arduino respectively. And GSM module is powered by using a 12 volt adaptor. The code of the program is easily understandable; the new thing here is GSN initialization function gsm_init(), which is explained in the end. In the program, first of all we include library for liquid crystal display (LCD) and then we defines data and control pins for LCD and some variables. After this, serial communication is initialized at 9600 bps and gives direction to used pin. And initialize GSM Module in setup loop. For receiving data serially we use two functions, one is Serial.available which checks any serial data is coming or not and other one is Serial.read which reads the data that comes serially. Initialization function ‘gsm_init()’ for GSM is important here, where firstly, GSM module is checked whether it is connected or not by sending ‘AT’ command to GSM module. If response OK is received, means it is ready. System keeps checking for the module until it becomes ready or until ‘OK’ is received. Then ECHO is turned off by sending the ATE0 command, otherwise GSM module will echo all the commands. Then finally Network availability is checked through the ‘AT+CPIN?’ command, if inserted card is SIM card and PIN is present, it gives the response +CPIN: READY. This is also check repeatedly until the network is found. This can be clearly understood by the Video below. GSM receiving the message and showing on serial monitor but not displaying on LCD . What may be the reason??? Have you fixed your circuit in PCB??? Check circuit connections and code. how would i intialise the the gsm module after writing the code in arduino, like how would i write those AT commands in gsm module?and would u mind sharing ur mail id for further communication? sir.How to Display the message on Led matrix .please tell what I modify in the Program and circuit diagram. The above code after some modification is able to receive message and display it on serial monitor but not on LCD display please help me. your email id is not correct. yes, string is in # and *. The code and circuit diagram are correct, please cross check them twice. Check you LCD, whether it is working properly. What are you getting on LCD. what program do you use to draw your circuit diagram ? Proteus with Arduino Library installed. can you please help me design a circuit diagram for an a Wireless Notice Board using Arduino Uno and GSM? I truly appreciate your work, you have really helped me like anything. Thanks for this bro.!! Interesting reading. I want to setup wireless notice board using SMS. Can I just use a tablet to receive TXt's with a sim, instead of a GSM module & just adapt the tablet to read more as a noticeboard ? You can use Tablet in place of Mobile Phone. can i use Bengali language in LCD display. Please help. Yes, you can, you need to generate hex code for each character in bengali using this online tool. sir,dont we need to set baud rate to 2400 as SIM900A does not work with 9600 baud rate. SIM900A works on 9600 baud rate. i have used arduino mega 2560 & GSM 800,do i have to change any part of the code as i was not able to display message. Thanks for a brilliant tutorial, nice and easy to follow. Mine does however refuse to display long messages (I would like to display about 30/40 words) but when I try this it either freezes/doesn't display any text at all or reboots by running through the GSM initializing, ECHO off and etc. How do I get it to recieve and display longer messages? You can display long messages by using the given program itself, it is using lcd.scrollDisplayLeft(); function for scrolling the long messages. I think there may be some problem in your hardwares. May you get more & more success. the code just jumps to Finding module, and nothing else, may you please send me one that works well. i m also getting the same problem ,the code just jumps to Finding module, and nothing else, may you please send me one that works well. It is the problem related to GSM Module, try to just connect GSM module and send AT command and then check whether your GSM responds with OK. Use serial monitor to check the response. hello sir!iam using gsm 800L.everything is ok but msg is not getting receoved and displayed on the lcd. is there something bigger than that 16*2 LCD sir/ma'am? something that can be used for larger establishments? grateful if you notice me. Is there a way to extend the 32 character limit displayed still using the 16x2 lcd? it worked! i have changed the pins to pin no 10 and 11 and it worked and a little bit change in the code. Hey please share the modified code. Sir, I need to make this one with a bigger dispaly.Is it possible?? Hi saddam, Great work. i'm an electronics enthusiast and try to build circuits and write codes. Every thing seems to be gud but the msg sent to the sim is not getting displayed on the screen. Pls suggest what can i do next. Sir , is this code suitable for 128x64 LCD??? How to compile the above program? and which software? Did you find the solution?I'm having the same problem. Is it possible to use a passkey for authentication? if so, can you please show me how? I have connected and write code on arduino as per this website . after running Lcd MONITER SHOWS"Circuit digest System ready.But when i send messages it shows same. that means message is not displaying ,or it may not receving.Can you help me ? is there anything that i have to modified these code ? hoping a convenient reply from you. Sketch uses 4118 bytes (12%) of program storage space. Maximum is 32256 bytes. Global variables use 608 bytes (29%) of dynamic memory, leaving 1440 bytes for local variables. Maximum is 2048 bytes. I am also getting the same problem now can u pls help me to fix it. sir, i am doing this project as my final project..if sir could help me with exact materials required?? Can we change the screen size? Which screen size should be take? Can we make messages be fixed. sir how much size we can increase of lcd kidly reply? Sir, how to use gsm module ?? How can i contact you personally ? Did you pair correctly? Make sure the BT module is working and Arduino is getting data from BT module. some people facing same problem...like me ..display showing nothing just showing Module fund...nothing else.....can you tell me what is the solution for this problem. sir i need one help..
i will send the message only in first line but not display in second line..